The Raynok Motion Control System can be found servicing a wide variety of distinctly different applications throughout the Entertainment Industry. Each of these applications requires an often distinctly different approach to present, cue and execute the desired motion profile. From pile-ons and autofollows to deads and targets there are as many varied names for similar functions as there are ways to create them. 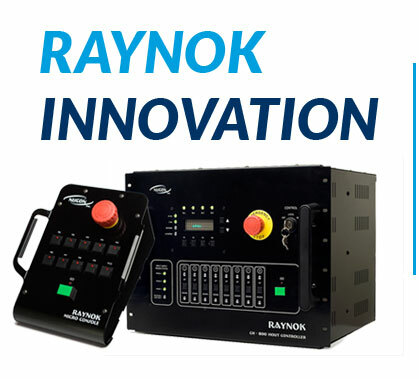 Raynok provides the flexibility to bring them all to the operator’s finger-tips. Probably the one of the most demanding application for any motion control application. From the time the equipment leaves the shop to the hour it returns the gear will see more road bumps, rushed load outs, rain storms, kicks, bangs and ice surfaces than your average hockey fan. Enjoy the road more confidently knowing that Raynok is on your team. No matter if your theatre is a 200 seat Community Centre Black Box or a 4100 seat Las Vegas Showroom, Raynok has a scalable solution that will provide the right features to move your scene and wow your audience. Stage Lifts, Rotators, Performer Flying, Rigging, Trucks, Tracks, Doors, Choppers… Raynok has done them all. Safety is always paramount when designing and installing a motion control system in an Entertainment Application. Entertainment is probably the only industry that allows for motion overhead in the manner that it is so commonly executed. Today’s students are tomorrow’s tech managers, operators and decision makers. Niscon Inc. is dedicated to helping students learn the Art of Motion Control so that the craft and engineering of our passion can continue to grow. We have many solutions that are geared directly to help educators get the equipment and technology they need to create the next generation of Entertainment Technician. Studio motion is an application in its own category. Rarely are the moves complex or the machinery high speed (beyond 180ft/min) but when it needs to run it needs to run now.